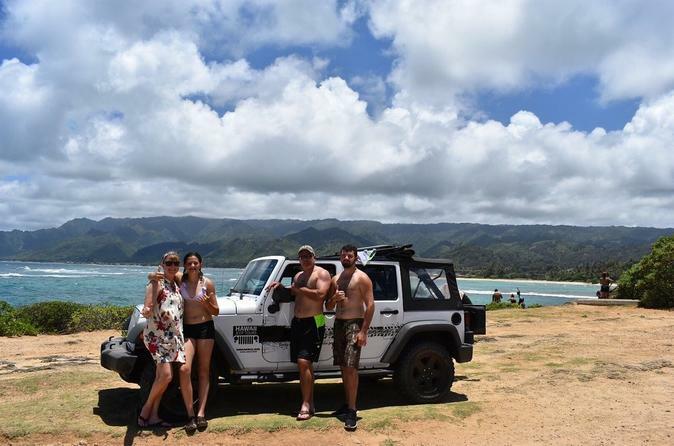 Jump in one of these customized Jeeps and get ready for an introduction to Oahu. Customized just for you, this 4-hour Half Circle Island Tour is a “go at your own pace” adventure which takes you to some of Oahu’s most popular landmarks and lookouts. This adventure allows you to quickly see what this Gathering Place is most famous for on this Island. From jagged coastlines to sprawling sandy beaches, it will be the perfect afternoon for you and your family. This 4-hour Half Circle Island Tour Adventure takes you to some of Oahu’s most popular landmarks and lookouts, so you can quickly see what this Gathering Place is most famous for on this Island. Your cruise along the southeast coat of the Island along the Ka Iwi Coast. From jagged coastlines to sprawling sandy beaches, your guide has planned out the perfect afternoon for you. Cruise along the coast and take a dip (optional) at a popular secluded pristine Beach. You'll also get a chance to take in the Pali Lookout on your way back to Waikiki where you'll learn about the battle of Nuuanu, where in 1795 King Kamehameha I won the struggle that finally united Oahu under his rule. This tour is a great day for the whole family to enjoy, your guide will be introducing you to the island in a very local way. Hanauma Bay: View the clearest waters of Oahu’s marine sanctuary, your guide will explain this natural wonder and the marine life that inhabit this very special place on Oahu giving you a great opportunity to get some beautiful pictures. Lanai Look Out: With stunning views of the waves and coastline, this lookout is named for one of the islands you can see during a clear morning. If on a clear day you will be able to see Maui, Molokai and even the Big Island when you walk down the lookout safely with your Guide. Halona Cove & Blow Hole: This natural water feature is amazing to witness. Seawater is pushed up through a lava tube in the volcanic rock and shoots into the air like a geyser. This is best viewed during high tide and windy weather, but is a beautiful lookout spot as many Movies like 50 First Dates and the Lost TV Series had been filmed at Halona Cove. Makapuu Lookout: Enjoy gorgeous views of Oahu’s East shore here, including Rabbit Island and the Mokulua Islands. This lookout is ideal for whale watching during the winter months and gives a great perspective of the war preparation with Military Pillboxes that line the mountain side which you and your guide will explore.